Kyle Busch thrives in the limelight whether it’s cheers or boos and on Sunday night drews mostly cheers and he won the 42nd annual Snowball Derby in front of a sellout crowd at Five Flags Speedway. The current NASCAR Sprint Cup star dominated this season, winning the Nationwide and Truck series. He had a disappointing Sprint Cup season, winning just four races and finishing out of the Cup Chase. That allowed him to come to Pensacola for the Snowball Derby and he led three times for 99 laps, including the final 25. “Winning the Snowball Derby means so much to me,” he said in Victory Lane. “What a race car I had. I was nervous the last 10 laps.” Busch pulled away after passing 2005 Snowball Derby winner Eddie Mercer of Pensacola on Lap 276. Mercer took second, while 2004 winner Steven Wallace was third. Bobby Gill was fourth and John Bolen fifth. Polesitter Johanna Long finished 18th, two laps down, while Augie Grill’s bid to become the first driver to win consecutive Snowballs ended with a wreck and he finished 31st. Busch started third and edged Long to take the lead on the opening lap. Grill, starting in fourth, passed Busch for the lead on Lap 29. On Lap 59, two cars in front of Grill spun and Grill ran into the back of one of them, but didn’t do much damage. He gave up the lead on Lap 96 when he came into the pits for fresh tires. Casey Smith, who had pitted earlier, took the point for 67 laps. Grill, however, restarted in 26th and was hit by Justin Drawdy as he was trying to work his way to the front. The damage slowed him down considerably and he parked the car shortly after that. Mercer took over the lead on Lap 163 when Smith and other leaders went into the pits for fresh tires. Eighteen laps later, Mercer became the all-time Snowball Derby lap later, passing Bobby Gill, who has 694. Mercer now has led 744 laps. The frustration continued for Smith, who began to back up shortly after pitting for fresh tires. His pit crew put the right-side tires on the left side and he later suffered damage to his car. Busch passed Mercer for the lead on Lap 208. Mercer, who later pitted, worked his way back to the front and regained the lead on Lap 246 when Busch and the other leaders pitted for their final set of tires. Mercer held it through three more cautions but Busch cleared some lap cars and went low in Turn 1 to take the lead for good on Lap 276. There were 14 cautions in the race for 108 laps. Lap leaders: Busch 1-28; Grill 29-95; Smith 96-162; Mercer 163-207; Busch 208-245; Mercer 246-275; Busch 276-300; 7 lead changes among 4 drivers. Margin of victory: 2.778 seconds; Average speed: 62.071 mph.Cautions: 14 for 106 laps. Track record. Pole position. Forty laps led. Johanna Long, the teenage driver from Pensacola, made the Pro Late Model race look easy Friday night at Five Flags Speedway. “I couldn’t have asked for a better race,” she said. Her biggest issue came in practice when another car sideswiped her. Her crew had to replace the entire left side of the body, but the car was still fast. Her qualifying time of 16.985 seconds set a Pro Late Model record. Another nervous moment for her was when she rolled the dice to determine if the field would be inverted. “I saw it at 6, then it rolled over to a 1,” she said. That meant she was able to start on the pole and she pulled away and was never challenged. Keith Thorpe and Ronnie Smith finished second and third in the caution-free race. The 27 is Smith who entered the race tied with Thorpe for the points lead. Thorpe gained two points in qualifying and another six points and now unofficially has an 8-point lead going into the 100-lap season finale in October. Thorpe’s biggest worry was starting outside of Long, while Smith was behind her. But Thorpe pulled quickly behind Long and Smith stayed third the entire race. Stevie Mercer won the 30-lap Sportsman feature, but the points chase behind him also drew some attention. With double points on the line, Billy Hoover finished second and gained on points leader Randy Thompson. Thompson had worked his way to second, but had to pit on a caution and restarted in 13th. He finished seventh and saw his 89-point lead shrink to 67 points unofficially with two races left. Jim Pokrant took the lead on the opening lap and held it through the first 11 laps. Mercer passed him for the lead, but the caution came out, putting Pokrant back in front. But on the restart, Mercer passed him again and held it this time for good. Four cautions in the race included some in which tempers flared. Steve Buttrick, who spun out Chris Palmer and had to restart on the back, worked his way back to finish third. Nathan Ingersoll won the 25-lap Modified feature and also took over the points lead. He entered the race 12 points behind Chris Cotto, who suffered a flat tire with three laps left. Ingersoll now leads the points race unofficially by eight points. Phillip Merryman finished second, while Jeff Darby was third. Pete Kitchen won the 15-lap Bomber feature, while Michael Kitchen finished second to hold off William Goulet in the points race. Goulet trailed Michael Kitchen by 10 points going into the race. He passed Michael Kitchen for second with five laps left, but Michael Kitchen retook the position a lap later. Goulet finished third. Pete Kitchen passed Mike Goraum on a restart. Scotty Anderson paid the perfect tribute by driving John Shuffler’s car to victory Friday night in the 35-lap Wayne’s Diner Super Stock Showdown at Five Flags Speedway. Shuffler suffered a stroke earlier in the week and is hospitalized in Fort Walton Beach. Anderson works on Shuffler’s car and keeps it in his Opp, Ala., shop. And he did it in dominating fashion, leading the final 30 laps and through several restarts. Earl Polk started on the outside front row and led the first five laps. He was elated with his second-place finish. Anderson caught Polk on Lap 5 and passed him on the backstretch to take the point with Tommy Rollins in third. It stayed that way through Lap 17 when the caution came out for a car that stopped on the backstretch. Shortly after the restart, points leader Shannon Jackson got underneath Chris Cotto. But they both spun out in Turn 1 and hit the wall. During the caution, Rollins pitted, giving up his third-place spot, and did not return. Anderson was able to pull away from Polk after each restart. He and the crew had to make heavy repairs after the previous race when Shuffler hit the wall and had to climb out of a burning car. They repaired the car, then when Shuffler suffered a stroke, Anderson went from mechanic to driver. David Jones of Mobile won the 40-lap Pro Late Model feature. Keith Thorpe started on the pole and led the first 38 laps. He seemed in position to take over the points lead when Ronnie Smith spun out and suffered some damage on Lap 3. In fact, as the race neared the end, Thorpe was about to put Smith a lap down. But Brandon Odom caught Thorpe as they weaved through lap traffic. Odom bumped Thorpe, who spun on Lap 38. Both drivers had to start at the rear of the lead-lap cars, putting Jones on the point. He pulled away from James Kimbrough on the final two-lap sprint for his first victory. Keith English took third. Thorpe was working his way back, but he spun out on the final lap and finished ninth. Smith was eighth and unofficially the two drivers are tied for the points lead. Randy Thompson won the 20-lap Sportsman feature when Stevie Mercer was disqualified in postrace inspection. Mercer passed Thompson on Lap 6 and went on to take the checkered flag. Brannon Fowler was second and Steve Buttrick third. Kenny Bullard won the 20-lap Bomber feature when Pete Kitchen was disqualified in postrace inspection. Kitchen had led all 20 laps to take the checkered flag. Michael Kitchen was second and Mike Goraum was third. Scotty Anderson paid the perfect tribute by driving John Shuffler’s car to victory Friday night in the 35-lap Wayne’s Diner Super Stock Showdown at Five Flags Speedway. Shuffler suffered a stroke earlier in the week and is hospitalized in Fort Walton Beach. Anderson works on Shuffler’s car and keeps it in his Opp, Ala., shop. “He called me from the hospital and insisted that I drive his car,” Anderson said. “I couldn’t say no.” And when Anderson stopped in Victory Lane, he quickly called Shuffler, saying, “I won. I won this race for you.” And he did it in dominating fashion, leading the final 30 laps and through several restarts. Earl Polk started on the outside front row and led the first five laps. He was elated with his second-place finish. “Scotty deserves it,” Polk said. “This was a great finish for us. We had good restarts every time.” Anderson caught Polk on Lap 5 and passed him on the backstretch to take the point with Tommy Rollins in third. It stayed that way through Lap 17 when the caution came out for a car that stopped on the backstretch. Keith Thorpe started on the pole and led the first 38 laps. He seemed in position to take over the points lead when Ronnie Smith spun out and suffered some damage on Lap 3. In fact, as the race neared the end, Thorpe was about to put Smith a lap down. But Brandon Odom caught Thorpe as they weaved through lap traffic. Odom bumped Thorpe, who spun on Lap 38. Both drivers had to start at the rear of the lead-lap cars, putting Jones on the point. He pulled away from James Kimbrough on the final two-lap sprint for his first victory. Keith English took third. Thorpe was working his way back, but he spun out on the final lap and finished ninth. Smith was eighth and unofficially the two drivers are tied for the points lead. Randy Thompson won the 20-lap Sportsman feature when Stevie Mercer was disqualified in postrace inspection. Mercer passed Thompson on Lap 6 and went on to take the checkered flag. Brannon Fowler was second and Steve Buttrick third. Kenny Bullard won the 20-lap Bomber feature when Pete Kitchen was disqualified in postrace inspection. Kitchen had led all 20 laps to take the checkered flag. Michael Kitchen was second and Mike Goraum was third. Augie Grill sat on the pole and led 70 laps, including the final 37 to win the Carpenter’s Campers 100 Blizzard Series Super Late Model race Friday night at Five Flags Speedway. Bubba Pollard was second, followed by Johanna Long, Hunter Robbins and Chuck Barnes Jr. Casey Elliott, the 13-year-old son of NASCAR legend Bill Elliott, started 12th and finished 18th, one lap down. Grill, the two-time defending Snowball Derby champion, had the dominant car most of the race, but also took advantage of some bad luck by other contenders. Pollard and Long, 1-2 in the points race, both had to pit just as the race was about to begin, forcing them to start near the back of the 23-car field. But both worked their way to the front to maintain their standings in the points with one race left. He was the fastest qualifier, but outside pole sitter Eddie Mercer took the lead on the opening lap and held it for the first 29 laps. Grill eventually caught and passed him on Lap 30. He held the lead until a caution on Lap 62 allowed most of the leaders to pit for fresh tires. Grill was fifth when the race restarted and he jumped to the outside, passing all four cars in front of him to retake the lead. From that point, he was never challenged. One at a time was how Pollard and Long had to work their way through the field. On the opening lap, Pollard slowed, bringing out the caution before the first lap was completed, forcing a complete restart. He was in sixth by Lap 50 and was third on the final restart on Lap 76. He took over second a couple of laps later when Donald Long’s transmission broke. "We just never gave up, but I used up the left side tires running so hard,” Pollard said. Johanna Long was set to start the race third, but had to pit just before the race started to replace a flat tire. She said she was happy with her finish considering her start. "I didn't think I would finish this high. Then when we pitted on Lap 36, I knew we would have old tires at the finish. I was just trying to get by everyone without doing something dumb." Mercer finished ninth. When he entered the pits on Lap 62, he had a long stop and dropped from second to 13th. Pensacola drivers Scott Carlson was sixth and Wayne Niedecken Jr. was 10th. Shanna Ard took Tina Davidson’s Sportsman car and drove it to a win in the 20-lap feature. Davidson stepped out as driver while her husband battles cancer. Ard took the lead on Lap 6 when the top two cars were involved in a spin. Points leader Randy Thompson was about to pass William Kitchen when he got loose. He slid sideways, then corrected, but got into Kitchen, who spun out and was hit by Stevie Mercer. Ard took over the lead and held it the rest of the way. Steve Buttrick was second and Thompson worked his way back to third. Mike Goraum started on the pole and led all 20 laps to win the Bomber feature. Goraum was trying to hold off Pete Kitchen, who took the lead briefly on Lap 9, but had to give it back when a caution came out before the lap was completed. On Lap 14, Kitchen slowed and hit the wall to fall out of the race. William Goulet finished second, while Michael Kitchen was third. Just after Goraum took the checkered flag, Daryl Lynchard hit the frontstretch wall hard, then was hit in the door by Rick Thompson. Both drivers were unhurt. Mark Chrudimsky won the 25-lap Modified feature. Mike Maddox was second and Chris Cotto was third. PENSACOLA, Fla. - The Tampa Bay Area Racing Association made their first visit to Five Flags Speedway in 25 years Friday night and the packed grandstand was not disappointed as veteran David Steele wheeled his jet black No. 14 winged sprint car to a convincing victory in the 30 lap feature event. Larry Brazil Jr. hustled from the pole position to head the 24 car field but it was short lived as little Jimmy Alvis looped his No. 21 on the front chute to bring out a yellow flag and a complete restart. The field realigned and once again it was Brazil out front with the field in tow. By lap 10 Mickey Kempgens was the man out front as Steele had sliced through the field and closed in on Kempgens but on lap 16 the yellow waved as Kempgens suffered mechanical failure and stopped on the track. When the green waved for the restart Steele was in the catbird seat out front, but Brian Gingras stalled and the start was called back. The start was good the next time and away Steele went, leading the strong field around the quick half-mile oval to the checkers without further incident. Shane Butler gave chase but settled for runner-up money ahead of Bo Hartley, Troy DeCaire and Brazil. Heat race victories went to Brazil, Steele and Kempgens. First heat (8 laps) - 1. Larry Brazil, Jr., 2. Tommy Nichols, 3. Troy DeCaire, 4. Dave Shotsberger, 5. Stan Butler, 6. Gary Gimmler, 7. Jimmy Alvis. Second heat (8 laps) - 1. David Steele, 2. Joey Aguilar, 3. Dude Teate, 4. Bobby Rose, 5. Michael Miller, 6. Wendy Mathis. Third heat (8 laps) - 1. Mickey Kempgens, 2. Dustin Perez, 3. Little Jimmy Alvis, 4. Greg Leonard, 5. Steve Heisler, 6. Shane Butler, 7. Casey Hinds. Feature (30 laps) - 1. Steele, 2. Shane Butler, 3. Hartley, 4. DeCaire, 5. Brazil, 6. Aguilar, 7. Leonard, 8. Teate, 9. Perez. 10. Kempgens, 11. Little Jimmy Alvis, 12. Gimmler, 13. Shotsberger, 14. Mathis, 15. Heisler, 16. Gingras, 17. Nichols, 18. Dakotah Stephens, 19. Rose, 20. Hinds, 21. Stan Butler, 22. Jimmy Alvis. DNS Richard Waddell and Miller. Johanna Long won her second Blizzard Series feature of the season Friday night, starting on the pole and leading 84 of 100 laps at Five Flags Speedway. The 17-year-old continued to show her talent before an approving crowd. But the win was not without some excitement. She had comfortably led for the first 59 laps when she came upon some lapped traffic. She couldn’t get around them and Casey Smith zipped down low to take the lead from her. But on the next lap, Smith spun when Augie Grill – who was about to be lapped – spun. That returned the lead to Long as she and the other lead-lap cars pitted for fresh tires. Eddie Mercer, who was pitted at the end of pit road, barely beat her out of the pits to take the lead. About 10 laps later, Long chased Mercer down and was right on his bumper. On Lap 76, Mercer spun on the backstretch with Long right behind her, giving the lead back to Long. She then held off points leader Bubba Pollard through two more restarts to secure the victory. David Rogers finished third, Grill took fourth and Steven Davis was fifth. Mercer worked his way back to finish eighth. Nineteen of the 22 cars finished on the lead lap. Grill, the two-time defending Snowball Derby champion, started 18th and couldn’t pick up speed until numerous pit stops later in the race. Pete Kitchen won the 20-lap Bomber feature to open the night’s racing. Daryl Lynchard led the first three laps. But Kitchen took over the lead with a low pass in Turn 2 as Lynchard drifted high and fell back to fourth. Later, Lynchard brought out the only caution of the race on Lap 10 when he was turned by another driver and spun out in Turn 4. On the restart, points leader Mike Kitchen pulled even with Bo Hancock and made the pass for third place. Then he went outside of William Goulet and the two raced side-by-side for several laps, before Mike Kitchen passed him for second on Lap 15. That duel allowed Pete Kitchen to keep a comfortable lead and Mike couldn’t catch him. Later, Mike Kitchen was disqualified in postrace inspection. Super Stock driver Tommy Rolllins had wondered if he still had it. He did. Rollins led all 25 laps for the feature win. Rollins, John Shuffler and Randy Thompson ran a tight 1-2-3 for the first 14 laps until a caution came out for debris on the track. Rollins actually pulled away after the restart. On Lap 18, Shuffler went under Thompson and took second place a lap later. Thompson finished third. Points leader Shannon Jackson started eighth and briefly worked his way to fourth before falling to fifth. Darryl Rudd was fourth. Before the start, the cars lined up in the Missing Man formation for former Super Stock Freddie Tanner, who recently died. Randy Thompson passed Billy Hoover to win the 20-lap Sportsman feature. Steve Buttrick finished third. Bubba Pollard officially led one lap, but it was really only about 10 feet. The Georgia driver made a dramatic pass of Augie Grill just in front of the finish line to take the Papa John’s 100 Super Late Model Blizzard Series feature Friday night at Five Flags Speedway. It was one of the most dramatic finishes since the Blizzard Series started in 2004. As the white flag came out for the final-lap sprint, Pollard pulled even with Grill, but Grill inched ahead down the backstretch. But coming out of Turn 4 to the checkered flag, Grill started to slide sideways and Pollard pulled low and edged him for the win. The final 50 laps were filled with drama. Grill, who was the fast qualifier, led the 27-car field through the first 50 laps, which were caution free until Wayne Niedecken Jr. and David Rogers got together. When the lead cars pitted for new tires, Pensacola’s Eddie Mercer emerged from the pits first. On the restart, he was second behind Ken McFarland, who did not pit, while Pensacola’s Johanna Long, the winner of the season opener, was third. Mercer quickly passed McFarland to assume the lead, but Grill tapped Long and sent her sliding through the grass, dropping her back to 13th. It appeared that Mercer was cruising to a victory until he came upon the lapped car of Chet Morrison, who stayed on the low side. That forced Mercer to slow, while Grill zipped around the outside to take the lead with 19 laps left. Mercer stayed right behind Grill and appeared set to make a pass, but he got loose on Lap 89 and fell back to fourth. Meanwhile, Pollard closed behind Grill for the final dramatic laps. Casey Smith started seventh and finished third. He said dealing with the lapped cars were a problem. Mercer finished fourth and Hunter Robbins was fifth. Long took eighth. It took three restarts to get the Sportsman feature started, but once it did, Randy Thompson made quick work of the competition, taking the 20-lap feature. He and Steve Buttrick squeezed around polesitter Marty White in Turn 1 on the opening lap. Thompson grabbed the lead and never was challenged after that. Billy Hoover moved up to second. Shanna Ard, who had suffered damage on one of the restarts and had to pit briefly, came from the back and worked his way up to fourth by Lap 6. He caught William Kitchen for third on Lap 18. Hoover was disqualified in postrace inspection, giving second to Ard, while Chad Robinson was third. Daryl Lynchard won his first Bomber feature in exciting fashion, passing Pete Kitchen two laps from the finish. Kitchen, the polesitter, jumped out to the lead and his brother, Michael Kitchen, the points leader, followed him in second. On Lap 11, Michael pulled even with Pete in turn 1 but the caution came out shortly after that. On the restart Lynchard jumped out to second, but got loose a lap later and dropped back to sixth. But luck was on Lynchard’s side as the caution came out again, allowing him back into second place since that was his position on the last completed lap. On Lap 17, Lynchard pulled even with Pete on the backstretch and took the lead coming out of turn 4 with two laps left. Michael passed Pete for second and made a run at Lynchard, pulling even in turn 1. But he got loose and Lynchard took the checkered flag. Danny Bagwell won the 35-lap Modified feature, taking the wheel just minutes after driving in the 100-lap Late Model race. He finished 14th, two laps down in the Blizzard race, then started ninth in the Modified feature. He was running third when leader Chris Cotto was spun out by Nathan Ingersoll on Lap 26. Bagwell took over the lead and held off Mike Maddox for the win. Ryan Redmon finished third. Papa John’s 100 Blizzard Series – 1. Bubba Pollard; 2. Augie Grill; 3. Casey Smith; 4. Eddie Mercer; 5. Hunter Robbins; 6. John Bolen; 7. Ryan Sieg; 8. Johanna Long; 9. Josh Hamner; 10. Jeremy Colangelo; 11. Stephan McCurley; 12. Jeff Fultz; 13. Bryce Walker; 14. Danny Bagwell; 15. Scott Carlson; 16. Matt Smith; 17. Tim Martin; 18. Stanley Smith; 19. Cecil Chunn; 20. Chet Morrison; 21. Ken McFarland; 22. Donald Long; 23. Brandon Harris; 24. Donnie Wilson; 25. David Rogers; 26. Wayne Niedecken Jr.
James Kimbrough couldn’t have envisioned a more perfect start to his Pro Late Model racing career. The teenager from West Florida High started on the pole and led all 40 laps in winning the feature Friday night at Five Flags Speedway. How improbable? Kimbrough just bought the race car three weeks ago and the first time he even drove it was the day before in practice. Kimbrough won the Bomber track title in 2006 and the Super Stock title in 2008. He and his father bought the car from Dewayne Middlebrooks after the season opener last month. Kimbrough credited many people for helping him, including Tracy Goodson for letting him use his race shop and car hauler. He didn’t even realize that he would start on the pole until he heard the inverted start announcement. “That’s when I started to get a little nervous,” he said. One crew member even suggested he start in the back. But Kimbrough jumped out in front and led the first uneventful 26 laps. Then Ronnie Smith, who was running third behind Brandon Odom, got into Odom’s rear, spinning him out. Allen Pierce couldn’t stop in time and slammed hard into Odom. When the cars came around to stop for the red flag, Odom climbed out of his car and he and a crew member confronted Smith, who restarted the race from the rear. Smith said it wasn’t intentional, but Odom, the winner of the season-opening race, wasn’t buying it. “I’ll remember that,” Odom said. On the restart, Kimbrough took off, while veteran driver Wayne Niedecken Jr. took over second place, but couldn’t catch the youngster. “I was too loose,” Niedecken said. For Kimbrough, it’s a sign of things to come. Jonathan Day won the 15-lap Bomber feature, ending Michael Kitchens’ three-win streak. Pete Kitchen was second, while Michael Kitchen took third. Stevie Mercer held off Randy Thompson to win the 20-lap Sportsman feature. William Kitchen finished third. Shannon Jackson took the lead on the opening lap and cruised to a victory in the Super Stock feature, his second win of the season. Chris Cotto worked his way to second, while John Shuffler was third. Five Flags Speedway - Johanna Long quickly topped the amazing feat of winning the Pro Late Model points title last year at Five Flags Speedway. She took the lead with 19 laps left and became the first woman to win a Blizzard Series race on Friday. 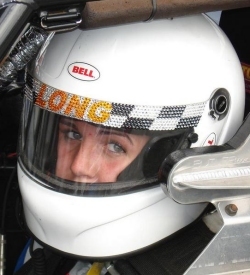 Long, a teenager from Pensacola, becomes the second woman to win a Super Late Model race at the track after Tammy Jo Kirk won the 1994 Snowball Derby. Long started third and stayed near the front the entire race. She took the lead from polesitter Casey Smith on Lap 60, but three laps later pitted for fresh tires during a caution. She came out in third place behind leader Augie Grill and Ryan Lawler, the Kyle Busch car driver, both of whom had pitted earlier in the race. It took her about 12 laps to catch Lawler for second place. Just one lap later, Grill unexpectedly slowed in Turn 3 and Long dove underneath to grab the lead. She steadily pulled away from there. Bubba Pollard finished second, while Ryan Sieg was third, Lawler fourth and Ryan Crane fifth. Long’s father, Donald, didn’t fare as well. His race ended on Lap 38 when his throttle stuck and he hit the wall in Turn 3, finishing 23rd. Smith easily set a track record in qualifying since the grinding of the track in the off-season has led to a faster track. But his tires began to fade and Long eventually caught him 60 laps in. Stanley Smith hit the wall in Turn 1 on Lap 5 to trigger a multi-car pileup of several cars in the back of the pack. On the restart, it was basically single-file racing with no changes among the top five until the caution came out on Lap 33 for debris. Grill, running fourth, was the only car among the leaders to pit for fresh tires. Eddie Mercer also pitted. The fifth caution came out just three laps later when Wayne Niedecken Jr., running fifth, was spun out in Turn 2. The red flag came out two laps later for a big pileup. Smith went low, trying to pass the lapped car of Roger Reuse, who spun and took out several drivers. Smith’s car suffered some damage and he had to pit. That set up the final shootout that propelled Long to a big victory. Five drivers topped the previous mark of 16.80 seconds set by Mercer. Billy Hoover started on the pole and led all 20 laps to take his second Sportsman feature win in three races this season. William Kitchen tried to challenge him on a restart following a Lap 5 caution when Shanna Ard’s motor quit. But Hoover held off Kitchen and pulled away. Kitchen finished second after Stevie Mercer’s car was disqualified. Jim Pokrant finished third, while Randy Thompson was fourth. John Shuffler won the Super Stock feature, while Tommy Rollins was second and Randy Thompson third. Blizzard Series – 1. Johanna Long; 2. Bubba Pollard; 3. Ryan Sieg; 4. Ryan Lawler; 5. Ryan Crane; 6. David Rogers; 7. Casey Smith; 8. Augie Grill; 9. Cecil Chunn; 10. Josh Hamner; 11. Scott Carlson; 12. Eddie Mercer; 13. Ken McFarland; 14. Hunter Robbins; 15. Wayne Niedecken Jr.; 16. Danny Bagwell; 17. Tim Martin; 18. Matt Smith; 19. Mitch Cobb; 20. Korey Ruble; 21. Roger Reuse; 22. John Bolen; 23. Donald Long; 24. Stanley Smith; 25. Chris Davidson; 26. Jeremy Colangelo; 27. Steven Davis; 28. Rocky Boyd Sr.
Alabama native Augie Grill was declared the winner of the 41st Annual Snowball Derby Sunday at Five Flags Speedway. Grill, who also won last year's Derby, was awarded the win after Brian Ickler's car failed post race inspection due to an illegal tire cooling device. Grill worked his way from fourth to second in the final 30 laps of the race. He closed on Ickler after clearing two lapped cars, but ran out of laps. With the win, Grill becomes only the second driver to win the prestigious race back to back. Rich Bickle Jr. won the race in 1990 and 91 as well as 98 and 99. Grant Enfinger finished second after starting the race from the pole and leading the first 71 laps of the race. He was part of a four car wreck on lap 206, but battled back to finish strong. Matt Hawkins finished third while Shane Sieg and Bubba Pollard finished fourth and fifth. There were six different leaders throughout the 300 lap race. Enfinger, Eddie Mercer, Wayne Anderson, Heath Hindman, Grill and Ickler all took turns at the point, with Ickler leading the most.